Dead Men's Respite is a Nordic barrow southwest of Morthal containing draugr and frostbite spiders. The barrow is related to the first quest of the Bards College. The ghost of the bard Svaknir is in the first room and will lead you into the dungeon. In the first room you will encounter the eager ghost of Svaknir. He is standing near the Ruby Dragon Claw. After he beckons to you, he will disappear, but will return to guide you through the tombs. 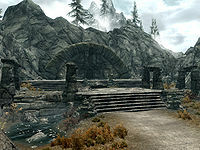 Taking the claw will awaken four of the draugr (You can kill them before you take the claw while they are still sleeping), as well as raise the gate directly across from the entrance. There are two small burial urns in the rubble in both the southeast and northeast corners of the room, another in the northwest corner, an urn to the left of the claw, and a medium coin purse in an alcove in the southwest corner. There are numerous dead draugr throughout the ruin that can be looted. To the north is an iron door. A small burial urn is in the rubble on the right-hand side as you approach. The door opens into a small, seemingly empty room, holding only a random sword and a random potion of healing. This room will eventually serve as the way out. Head back out to the main area and proceed through the now open gate. Follow the passage, watching out for a pressure plate that triggers a spear trap just before the intersection. From here turn left, heading north. As the passage descends, look for two empty random soul gems on a sideboard. Eventually, come to the end of the passage and a pull chain that activates several rotating doors in a row. The next area is more of the catacombs. As you move through, you pass more rotating doors on either side and begin to notice a proliferation of spider webs. At the end turn west and confront two frostbite spiders, continue forward passing an alcove on the right containing a random warhammer. At the end is an urn and behind some webbing an apprentice locked chest. Turn back around to the previous room, to the south is some thick webbing. Chop or burn your way through to enter a room ending in another pull chain. Again this will activate several rotating doors in a row. 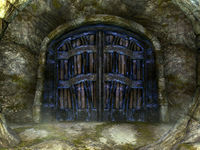 As the door opens, two draugr will be waiting just ahead. Past the draugr is a battering ram trap triggered by a pressure plate. Bypass it to retrieve a copy of the Speech skill book The Buying Game, a medium coin purse, a random potion of magicka and a random empty soul gem. Head through the passage to the north, encountering one more draugr slumbering in an alcove in front. At the bottom of the first set of stairs is a pressure plate that triggers a flamethrower trap. Bypass this and face a doorway covered with light webbing. Here, two frostbite spiders will drop from overhead. There are two bookcases with a random potion of magicka and a random empty soul gem on the shelves. To the right of the bookcases is a pair of random boots. At the rear of the room is a sideboard in the northwestern corner with a pair of random gauntlets on top and a random greatsword and another pair of random boots to the right. Opposite in the northeastern corner is another sideboard with an urn and a leather strip on top. There are also two lootable draugr cocooned in webbing on the north and east walls and one lying on the floor by the sideboard in the northeastern corner. 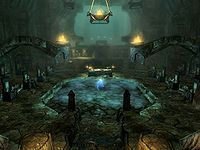 A further draugr corpse is lying beneath the first (shallow) floor grating, and can be looted with careful positioning. To proceed, activate the pull chain on the wall to open the trap door in the floor to reveal a well. Drop into the well to continue. There is nothing of interest at the bottom of the well and the way forward is to the east. Emerge from the water into a partially flooded passage and then into a larger cavern. A skeever is nosing about in the shallows, and a draugr is standing on a ledge, straight ahead, beside a soul gem, overlooking the room. Another draugr will emerge from the sarcophagus below the ledge, and more will ambush you from the left. Collect some loose gold coins and a coin purse from under the bottom of the spiral staircase. After finishing with them, go up the wooden spiral ramp winding around the pillar to the right. An adept level trapped iron gate bars the way across a stone bridge. Opening the gate without disarming the trigger in the bottom right-hand corner will set off four sets of swinging blade traps along the bridge. If you have to cross the bridge with the trap activated, a chain will turn it off on the far side, allowing any follower you have to pass safely. Follow the next wooden ramp up and then through a set of iron doors. In an alcove is an arcane enchanter built into a table with a random helmet to the left. A random potion of healing is on a sideboard to the left. Opposite the enchanter, to the west, along a short corridor is a magically sealed door and a sideboard with a stone bowl containing three canis roots. A passage to the right heads down some steps. Here you will find more leveled draugr to deal with. At the intersection, first go to the left. A pressure plate that triggers a spellcaster trap which shoots Frostbite spells, is in the doorway. It is easily avoided, but if you do activate the trap, remove the soul gem to the right to deactivate it. Another random empty soul gem is sitting in the same alcove, but may fall to the floor if you activate the trap. A dead draugr is on the floor along with a random potion of stamina and a random greatsword. A scroll of Circle of Protection is just inside the doorway on a plinth. Backtrack to the other side of the junction, heading north, to find an expert-locked door, behind which there is a master locked chest with random loot. After picking up your goodies, proceed down the stairs on your left. As you enter the circular room, the iron portcullis closes behind you, and the other gates in the room will open, expelling up to five leveled draugr. If you are sneaking, and provided your Sneak skill is high enough, it is possible to avoid facing the draugr all at once. The first gate on the south wall, where two of the draugr came from, has an unlocked chest with an apprentice locked trap that triggers a poison dart trap. It is easy enough to avoid the spray of darts from the ceiling by opening the chest and then jumping backwards quickly. The other two gateways in the room hold nothing of interest. Activate the chain to open the trap door in the center of the room and follow the spiral stairs down. At the bottom, the handle will open a section of the wall revealing Svaknir's body and the quest item King Olaf's Verse in his hand. Svanknir's ghost will disappear to go unseal the sealed doors. Make your way back up the wooden spiral ramp to see Svaknir waiting for you. Follow, and he will now open the previously sealed doors which lead to a puzzle door. The puzzle requires the correct combination of symbols as well as the Ruby Dragon Claw, found in the first room, to operate. The claw reveals the correct order of the symbols: Wolf—Hawk—Wolf. The next room contains the tomb of King Olaf, and a whole host of draugr arranged in chairs on either side of the room. Most of the seated draugr are alive, and upon waking, will swarm you. Simply entering the room and strolling about is enough to rouse them. If your Sneak and Archery skills are high enough you can pick some of them off before entering the room. After killing all of the draugr, Svaknir will bid King Olaf to rise, and upon doing so King Olaf will attack. Svaknir will assist you in the fight, and as he is immortal, he can finish off King Olaf if the King proves too tough an adversary. After the battle, make sure to loot King Olaf's body for the key to the treasure room. There is a leveled potion of healing and a random filled soul gem on the center embalming table, however, these will most likely get strewn about in the melee; find them close by on the floor. A word wall for a part of the Whirlwind Sprint dragon shout is behind King Olaf's sarcophagus, in the back of the room. King Olaf's key will open the door to the left containing an unlocked treasure chest, a random potion of strength and a random two-handed weapon. Opposite the chest, in a brazier, is a medium coin purse. To the right of the chest is a lever which opens the wall and provides you a shortcut out; back to the small room by the entrance to the barrow. This dungeon can be completed before activating the related quest. The ruby dragon claw and King Olaf's Verse will remain marked as quest items and cannot be removed from your inventory until after Viarmo receives King Olaf's Verse. It's possible to become trapped in Dead Men's Respite. 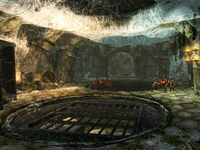 After jumping down the trapdoor well in the Frostbite Spider room, the only exit is through the Master-locked door near the word wall. On return visits to Dead Men's Respite, King Olaf is replaced with a leveled Draugr that does not hold the key to this door. Thus if the player didn't hold onto this key from their visit and runs out of lockpicks, there is no way out. This dungeon is often targeted for Radiant Quests; it is worth noting the following regarding the Boss/King Olaf’s room for return visits: the grating at the entrance will not drop until you have advanced sufficiently far into the room. This usually happens if you advance much beyond the dragon statues situated each side of the entrance. In total there are 15 live/sleeping draugr in the room, plus the boss draugr in the top sarcophagus (assuming Olaf was killed on your original visit). 4 of these are immediately below the boss sarcophagus, 5 are to the left of the shallow pool and 6 to the right. Therefore, with a good bow/crossbow, suitable ammo, high sneak ability and archery skills, and good observation it is possible to eliminate all the sleeping draugr before any wake up. You may then advance into the room (thus causing the grating to drop behind you) and the boss sarcophagus will open, making for an overall easier battle. Occasionally Svaknir will just sit by his corpse and not activate. Saving and reloading the game usually gets him moving. This page was last modified on 13 April 2019, at 20:47.